I discovered disqus about a year ago while enjoying one of my favorite blogs, Fred Wilson’s AVC. Believe it or not for a while I had it installed on my wordpress blog and thought it was pronouced DISK-OUS. Join 5100 others and follow Sean Hull on twitter @hullsean. Disqus does a lot of things great. The first thing you realize is they remove a huge hurdle for users across the web. Managing multiple logins on blogs here and there, when you just want to comment. This is your first of many wins. Bloggers can count on an increase in discussion, commenting & overall engagement. What’s more it reduces spam. Great! Bloggers want traffic, thats one reason they spend their valuable time sharing their knowledge. Jumping in to Disqus is one great way to do that. More robust discovery can push this much further. Driving traffic traffic for all of us will drive adoption of disqus across the web. Disqus provides a one-stop dashboard for all of this, and it’s wonderful for bloggers. o bloggers – who are the big shots? o how do I find opinion minded people? o how do I find intelligent discourse? o can I encourage more discussions on my blog? o How do I search – for this article, a comment that I posted? I found myself keeping a list of disqus blogs. I would follow these blogs around the web, and thought – Why am I doing this? Why isn’t this part of the software? What am I intuitively searching for? I was receiving the disqus digest emails. I think when you signup you automatically get those. I was mostly just deleting them, as they didn’t have much of interest in them. Then I started clicking through, and realized – hey wait, Disqus is kind of doing what I want already. They just need a little help. I decided to go to some of my favorite blogs. I visited AVC, RWW, Wired, HBR, businessweek, computerworld, chrisbrogan.com and scrolled down to disqus comments. I then clicked “community” tab. Along the right side you’ll see the most active commenters. I then clicked through to their disqus profiles, and “followed” them just like you might do on Twitter. After doing this for the top 5 commenters on ten to fifteen blogs, my disqus digests emails started bringing me new blogs! This is super cool. I’ve discovered some Venture, some technical and some iPhone blogs I never new about. Discovery is tech vernacular for what I was doing. Scouring the web for subject matter experts was exactly what I was doing. Picking the ones that used disqus allowed me to share my thoughts and weigh in across the spectrum of topics I knew well. Disqus digests came up short for some people. But after I started using the follow feature, suddenly blogs and authors were popping up on my radar. Exactly what I wanted. Keep up the good work guys. Would love to see the iPhone app if in fact it’s under development! Disqus can and should know what your favorite blogs are simply by looking at 1)frequency 2) your number of comments 3) to whom you’re replying, if any 4) what links you click on (if any) in those blogs or comments. All without doing that extra work, which, if you’re an enthusiast (you are) makes perfect sense. Yeah, agreed on all points. thx for the comments. I think this is a case where users inform the business on features they’d like to see. And it appears they’re listening. What I’d really like to see is an iphone app as I find disqus a bit clunky on safari mobile. I’ve asked them for an Android version of the platform too. Fingers crossed that we see that soon! You’re a CTO and I’m a poor, unemployed, childless Jewish widow, but you are wrong and @hullsean:disqus is correct, in this case. I do exactly what he described with Disqus. I even pronounce it as Disk-Us (and Line-Ux ;o) too. Anyway, I “meet” and interact with people via Disqus, follow some, get email digests, which is an optional free feature. It isn’t laborious; requires clicking one box in the settings. Others do too e.g. my favorite VC attorney, maybe even Fred Wilson. No, he doesn’t follow me, but I like following him and his friends! If you run a website, or blog, it isn’t complicated to do as Sean described. For someone with an entrepreneurial inclination, surfing Disqus is a fine way to network, as well as useful for information discovery, I’ve even run into the Mosaic browser guy, Mark Andreesseen (sorry, mispelled). He was having an impromptu round robin with 10 others, about web metric simplification (conclusion: it can’t be summarized to one or two measures) in the Disqus comments following a Mixpanel post on AllThingsDigital blog, in Jan 2013. Well then, you’re right and I’m wrong. It works for you, which is great. I’ll shed my Luddite skin and give it a try for a few weeks and see if the experience is any better. I know Arnold Waldstein. Well, sort of. I know him from Disqus interactions on his blog. He and I were the only QR code enthusiasts, approx 2 yrs ago. We still may be! He liked them for wine ID, and conventions badges. I liked them for the latter too, and for civic work. Not murky charity 501(c)(3)’s (and 501(c)(4)’s…urg) but as an additional tool for disaster planning/ response as well as the mundane, e.g. public health, U.S. Census. I moonlighted as a Census 2000 field worker in Manhattan, after my day job for S&P; QR codes would have facilitated building ID, on Pell St, 5 Points, TriBeCa. 🙂 I’m just starting to notice up votes as a criteria to identify great commenters. It is good, as criteria, I believe! It is yet another reason why “learning by doing” is valuable. Maintaining a blog/ website and Disqus offers a different perspective, and additional insight. That’s partly how my favorite VC law and Reg D-savvy attorney (let’s try summoning him with a Disqus invocation ;o) @wac6:disqus differentiates himself from the Juris Doctor masses. He hosts his own website, using Amazon EC2, with a blog and Disqus install. Very nice. I’m following him. @hullsean:disqus too: I just followed a few well-known people. They each only follow a few people. They each are followed by fewer than 20 people. Yet each have thousands of twitter followers. So maybe this is a great method for discovery, but the implementation and marketing of it needs help. Hehe. I figured everything is a “hack” these days so I’d get away with it! At the very least it’s a roundabout way to configure discovery in Disqus. I really hope they’re working on an iphone app as some @disqushelp folks have claimed. Haha. I like your writing style Ellie. Thx for the comments. Yeah I actually think followers on Disqus are useful now, unlike various other social platforms. Yup. We had something similar in the Engagio Labs. From the current Disqus Dashboard, we integrated a link that surfaced in real-time the blogs where your friends are commenting. We showed them, but they was no reaction. Maybe we can point out some of this stuff to Fred Wilson. He’s keen on discovery, and Disqus too. Will engagio ever return? I hope that buyout of engagio doesn’t mess it up. I find myself using the daily digests to find blogs, then commenting, and checking the community tab for followers. 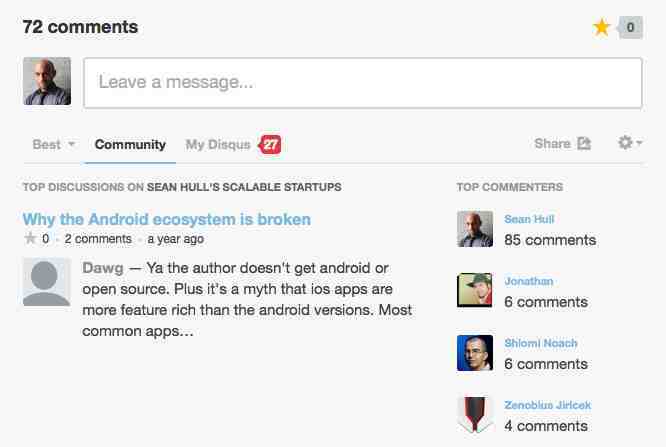 It’d be great to do all of that – discovery, commenting & replies all via a disqus app. A mobile app like that would compete heavily with twitter for my Social Media bandwidth. I appreciate the tip! And I found this blog because I follow Ellie K on Disqus (which I continue to pronounce “disk-us” just be contrary). wac6! You arrived, no summons or invocation necessary! Wow, thank you! I wanted to mention something you’d find of interest, and relevant to other entrepreneurial types, too. I was reading Fred Wilson’s AVC blog, and recall from a few months ago, that one of his regulars mentioned tacky, cookie-cutter attorney “bLAWgs”, resulting in curtailed credibility. I’ll find the comment, am still searching. Anyway, I thought of you, and Sean Hull. It can be better to do something oneself, albeit imperfectly. It encourages trust based on demonstrated authenticity. As long as the effort is not excessively amateurish, which Counselor Carleton’s and Sean Hull’s are NOT, the benefits are greater than may appear, if considering only time and billable costs. You know it’s called discuss right? I politely decline to participate in that pronunciation! blog.disqus.com read the content on the right sidebar. Don’t believe everything you read! I go with ˈdis-kəs . It’s how the company pronounces their name. I wish that everyone would respect that. bloggers – who are the big shots? Nice post! Just thought to mention you forgot to capitalize an “i”. Thx Andy. Which “i” ? Would you like to link back to http://magmoz.com/blog/disqus-vs-intensedebate-vs-livefyre-best-commenting-plugin-for-wordpress ? I’ll link back to yours so people can have a better view of Disqus. You mean in the comments? I think I did that. Or do you mean in the article? I missed this from previously. That’s a good trick, but once you do it once, and you get the novelty of the added content, then what? It’s not dynamic on its own. You need to keep tuning it manually. That said, I agree it’s a step in the right direction and it does enrich your discovered content. “You need to keep tuning it manually”. Yes you’re absolutely right. I’m really hoping they are working on this. It would be great for bloggers & great for their traffic as well. Discovery is what we all want. Exactly. Did you use Engagio last year by any chance? We were on our way there. I’d heard of it, but no didn’t use it. It had some good discovery tools, I’m guessing? It looks like it was a hit. Lots of glowing comments in there. I guess that’s why it was snapped up. Is it still available with influitive? No, they will re-integrate it differently into their own platform. It served a niche of users very well, those that are active with comments and discussions. I see. Well let’s hope that Disqus takes some of this stuff to heart, and rolls more into their product. The new analytics stuff they announced today is another step in the right direction. I find disqus really effecitve and so easy to use ! btw, love the graphic on Search & More. Good stuff. Thanks Sean. Although I understand how to comment when using disqus. How can i get followers? Click on the “community” tab, and to individual profiles for the “follow” link. Getting followers, I would say involves writing intelligent & insightful comments. Anyone interested in discovery with Disqus, take a look at what @falicon has built. It’s is a web, iOS and Android comments searching tool. Pretty cool so far. Get gawking! Very well put together. Although, I am now trying to campaign Disqus to give us the choice to decide if we want to be followed or not. Like you, I have enjoyed sharing my opinion with others in healthy debate for many years. That was until someone decided that they wanted to use me to take control over the other long time posters on a Disqus powered blog in a very illegal and frankly scary way. That sounds very unpleasant. Sorry to hear that. Seems like it’s all or nothing, though I haven’t tried it. That’s correct. And good point. Definitely noted. They’re probably rolling out the feature slowly. For instance I would think people would want to share their profile with blogs they post on, but not the world. Or share other posts they’ve posted on that same blog. But as with the early iphone, it’s easier to roll out fewer features and get them right, than too many. It would be nice to be able to stop people from following in the first place. In my position, I am being physically threatened on the RadarOnline blogs that are powered by Disqus. Before, I was able to go to the stalkers page and get screenshots of the harassment. Where now my stalker is now able to make it harder to grab the proof that I need to prove that they wont stop even though I have closed my account. These women are a gang that want to control a blog (for Lord’s sake). They’ve conducted a background check on me and used a Sargent from the Encino Ca police dept to obtain my record from the DMV. THE COST OF MY REGISTRATION BILL Even. They’ve created a website that gives my name my address, my unlisted phone number, my Inlaws information. THESE PEOPLE HAVE BEEN TO MY HOUSE. They have been harassing me since June 1st. Radaronline responded to my pleas for help by saying NO, I feel threatened, go to the cops. I don’t know what the hell to do. I do know that I’m scared to death. Late to the party, Sean. Nice post. Glad you discovered Discovery. Funny, meta moment: this post showed up in Daily Digest today! What I find is I spend a lot of time digging through daily digests, then going to those blogs to jump into the discussion. However all this is only really practical right now from a laptop & full browser. I would love to do this from a mobile app. Browse, discover, follow, comment, reply. A Disqus mobile app like that would compete a lot for my Social Media time, which is mostly twitter/hootsuite at the moment. I’m mostly tapping through digest emails on my phone. That’s also how I found this thread. What about the experience leads you back to a laptop? Notifications. Those come via email only. I *rarely* read & respond to email on my phone. I find it terribly cumbersome, and so only do it on laptop. Lastly typing in the web form. Fails sometimes, and I have to type all over again. A mobile app would solve all these problems, plus integrate disqus digests. Then I could remove disqus from my email queue where it doesn’t really belong. Fair comments. Valuable feedback, since we know how key mobile really is. Such an app would compete directly with twitter, which I *only* use on mobile, probably for 60-90 minutes per day whenever I have moments of “downtime”. I think other disqus users & bloggers would do the same. Twitter has a ton of spam, and noise. Disqus is *way* more high quality and relevant to my business & subject matter expertise. You can say that again, Mark. Actually I’m really so pleased to found this blog as it’s too much informative, thanks a lot to share with us ! Is spam on the menu at your restaurant? No it is spam. You post on every disqus article you can find, saying the same things. Your user name is keyword rich and your ‘comments’ provide very little value. Who are you trying to fool? Why not actively engage in relevant blog posts within your industry but then again your industry is probably SEO and not Restaurants in Mangalore. Thx guys, lets take this offline. Many many thanks for this wonderful article! or other types of feedback on your pages. That’s a great definition, yes. i was looking for something like this.. thanks for sharing the information.. Very enlightening stuff Sean. Its time to take a look on my blog too. Your sharing might be helpful for me. Love this @hullsean:disqus I can’t wait to try these fantastic tips. Thank you. Another great tool for stalking-out (I mean) finding other like minded folks is embedle. You can see who’s tweeted pages you’re interested in and find out more about them. Thanks again for the great article. I’ll take a look. Thank you Chandra. I see I’m a bit late to the party commenting here, but I had this feeling that I just didn’t ‘get’ the Disques thing, but with this tip I’m busy finding like minded people and finding interesting blogs before I got done reading your post. Obviously I found this blog post by looking for how to use Disques better, and I’ve read a bunch of blog posts that didn’t help at all. So big thumbs up to you. Great article. It’s always nice when you can not only be informed., but also entertained! As a simple google search I landed on this page and found out that it was like all the other blog posts. But, when i go through in the deep i found it very interesting and informative. I am interested to discovery with disqus and want some help about it. Great. I think the steps above should help you. Thanks for Sharing.. i have question. i want to increase comments in my blog how can i do that? Hi Faisal, the best way is to be more “active”. Seek out other sites that use Disqus and comment there, also share your content widely on social channels. You can also directly implore readers to comment. Believe it or not that affects behavior sometimes. At the end of the day it’s a traffic & numbers game. Less than 1% of readers will comment. I get a few comments per post. AVC.com for example gets hundreds. If you do the math you’ll see that it’s just their traffic is roughly 100x of mine. They’re a Pagerank of 6 while I’m pagerank of 5. So it sorta makes sense. Good information , this has been a barrier to us using this platform in the past, immediate feedback is so important! Thx Alicia. I think there’s huge potential around this. Nice and usefull info in this article..thanks! Awesome sauce! Thanks for the tips mark! All my thought was that all those hackers out there are just scammers until my cousin introduced me to this hacker I’ll never forget. He saved me from my cheating partner after he helped hacked his phone and social media accounts and I have access to all. You contact him on “freelancexhacker/at/tuta.io. This guy can help you in hacking phones, bank accounts, university database to change your school results and lots more. How do I find comments from other individuals? Looking for HARVEY Harris comments. Thank you for your time. That returned my profile. So you might try it for the person you’re interested in.
. . . Thanks, Sean. contact LORD ZEUS ON :[email protected]^^^^^^^^^^^^^!!! shows proof of work and payment is made only after your satisfied with his services! -Do you want a Professional hacker? Hack facebook ? Hack email? change school grades? Social Media Hacked? -Aswell as custom jobs within our area of expertise. -Need Password Recovery? Recover passwords from just about anywhere that uses one. -Looking for Someone? Find loved ones, missed connections or old friends with our world wide Person Locate Service. -Social Media Hacked? Get back control of your social media by recovering access. -information and getting your positive message out. -Cyber Stalkers? Dont be harassed or stalked online. Find the person responsible and put an end to it all. -Cheating Spouse? Find out for sure what your spouse is up to with our Digital Investigation services. -Website Hacking, Database Hacking, Email Hacking, Facebooking Hacking, Hacking a generic website, Gmail account access, Crack a password? I see different posts online about people been duped by fake hackers and it really hurts me to see people loose their hard earned money to some low life that calls themselves professional hackers when they are not. That’s the reason i’m here to save you all from getting scammed by this fake hackers again. [email protected] is my personal hacker and i’ve been using him for up to a year now and i’ve never been displeased with his job because he attains a clean job with no traces to keep both himself and his clients on a safer side. He is legit, tested and trusted. Give him a try and i promise you wont be disappointed. God bless! such as Facebook, Instagram, snapchat,Twitter, Blogs(link removal), youtube and others. *University grade change*Website defacing*Database hacking*Cyber stalking*iPhone Android hacking*bank tranfers and MTCN genaration*change credit scores *clear Criminal records*clear drivers license records.. and much more!